JUMLA, March 14: Hira Adhikari, 27, died in a road accident along the Karnali Highway this past week. A resident of Guthichaur Rural Municipality, he was hit by a tractor. Eyewitness claim that she was only wounded when the tractor hit her initially, but then the tracker reversed and crushed her to death. On Sunday, Maya Sarki, 27, died when she was hit by a public bus along the highway. Eyewitnesses claim that the driver was not responsible for her death. They claimed that the driver had blown horn to signal Sarki, a resident of Sundargaun, Tatopani Rural Municipality, to give passage to the vehicle through the narrow road. But, the women got confused and instead of clearing the way for the bus, came in its way. She died on the spot. Driver of the bus, Dev BC, a resident of Tikapur-6, is presently in police custody. Even though eyewitnesses’ account spared the driver of responsibility in her death, locals were not ready to forgive him. They blocked the highway for two days demanding immediate detention of the driver. Subsequently, the driver was put behind bars. These accidents are just the tip of the iceberg. Accidents along this narrow highway have in fact become a regular affair. Extremely narrow lane, lack of awareness among public and driver, unattended cattle on the roads, among other reasons have made it a risky road to travel. “Many sections along the highway are so narrow that it is impossible for two vehicles to drive along or cross each others. Still drivers do not hesitate to accelerate vehicles. 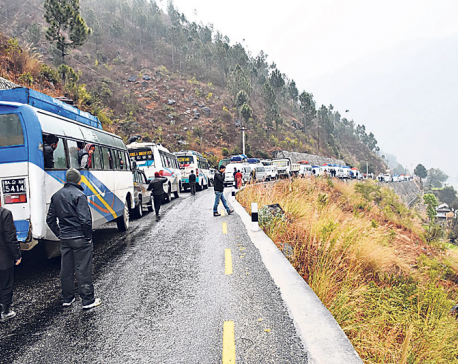 Along with that, unattended cattle, and haphazard crossing of the road by the pedestrians, make the road more prone to accidents,” Bishnu Poudel, chief district officer of Jumla, said. 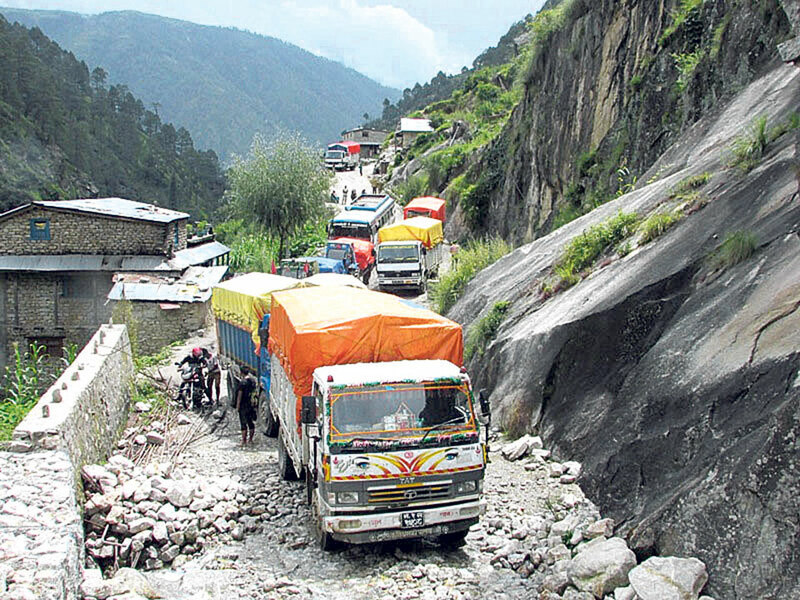 Poudel added lack of traffic signs and symbols as other contributing factors while also agreeing that the highway lacks mechanism for monitoring vehicular movement. “It is a highway. Hundreds of vehicles ply on it every day. It does not have enough traffic safety warnings signposts along it for vehicles and pedestrians. 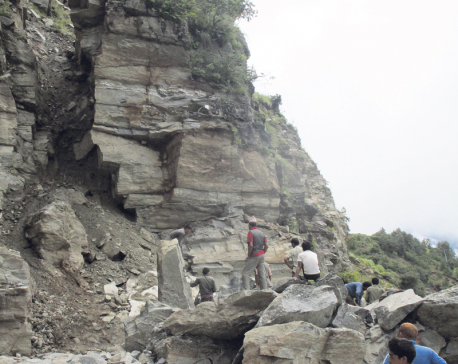 Along with that there are many shortcomings in the structure of the highway itself, which should have been considered during its construction,” Poudel said. He stated that all stakeholders must make a joint plan to address the problem. He called on the District Traffic Police office, the Department of Roads and transport entrepreneurs to come together for formulating and enacting road safety measures for the highway. “We have been hearing of the accident in the highway almost every day. Yet, we have not been able to do enough to address the problem. I feel that all the stakeholders must play their role and work jointly for making the highway safe,” he stated. He also emphasized on addressing loopholes within laws related to road accidents. Some drivers are accused of making deliberate attempts to kill accident victims, if the victim is only injured. “Some drivers are accused of killing accident victims instead of helping them get medical attention to exploit loopholes within existing laws,” he said. As per the law, vehicle owner is liable to pay for the treatment of the accident victims but in case the victim dies on the spot, then they are liable to pay certain amount. “It is perceived that an injured accident victim incurs more financial loss to the vehicle owner than a dead accident victim. Therefore some drivers deliberately kill accident victims on the spot,” said a driver demanding anonymity. Madhav Rawat, assistant sub inspector, stressed on the need to train drivers on road safety. “Drivers should be trained on road safety and the need to travel cautiously on roads. They should be discouraged to speed in narrow and accident-prone routes,” he said while also adding on educating the public about traffic safety rules. “Drivers must be given very clear instruction on road safety to follow. They are the ones who take the responsibility of so many people while plying on such risky roads,” he said. This week alone five people have lost life to accidents on the highway. Out of the 10 accidents, nine lost their lives during the current fiscal year. Rawat opined that most of the accidents could be averted by diverted if they followed road safety measures and called on implementing strict traffic regulations to reduce road accidents.